In the mid-‘70s, Jean Celeste tried her hand in an armwrestling tournament. She was quickly hooked and began attending events on the west coast. Her husband Tony Celeste, an insurance salesman based in Las Vegas, accompanied her to these tournaments and enjoyed the atmosphere. Many of the events were held in county fairs -- Tony felt that with his sales savvy, and armwrestling’s appeal, he could be successful in taking the sport to a higher level. So in September 1977, he formed Arm Wrestling International (AWI) and began planning his first tournament. The inaugural AWI event took place in January 1978, at the Maxim Hotel in Las Vegas. It consisted of a single open class. Any competitor of any weight could compete. 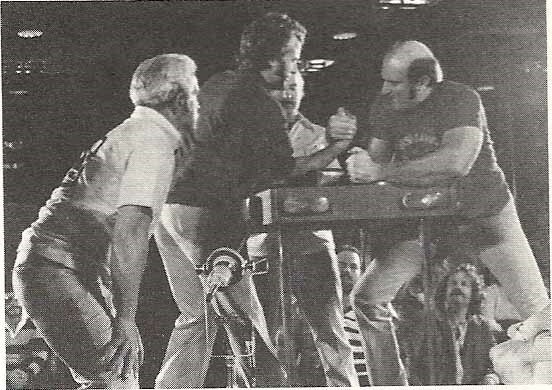 The entry fee was steep for 1978 ($100), however the cash prizes were higher than those offered at any other armwrestling tournament up to that time. There were cash prizes for the top eight finishers: $2,000 for 1st, $1,200 for 2nd, $800 for third, $600 for 4th, $400 for 5th, $300 for sixth, $200 for 7th, and $100 for 8th. The tournament used a double elimination format, a stand-up, pegged table (a Jeffrey Bros. professional table), and relatively standard armwrestling rules from the era. Tony had invited a couple of Oakland Raiders players to take part in this first event. Neither of them finished among the top eight, although the better of the two -- Mickey Marvin -- did manage to win a couple of matches. In the end, Virgil Arciero came out on top. This was not too surprising, because at the time he was considered by most to be the best armwrestler in the world. John Woolsey took second among an impressive field of competitors. Virgil Arciero and John Woolsey in the final match of AWI's inaugural event at the Maxim Hotel. Bob and Larry Jeffrey are the referees. The competitors who took part in the first AWI event were thrilled with it, and luckily Tony had more ideas in store. 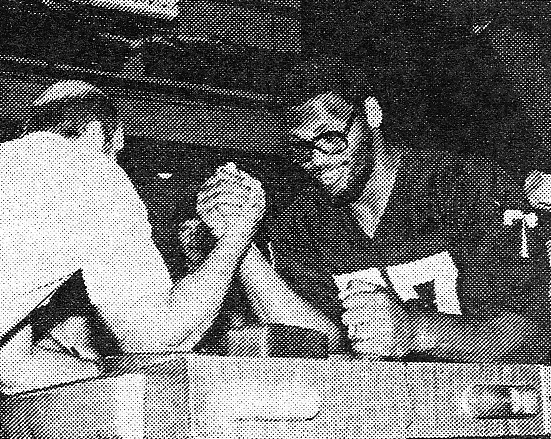 In June 1978, he organized the first Pro Football Team Armwrestling Championship in conjunction with a Professional Light Heavyweight (210 lbs) World Armwrestling Championship. NFL teams were invited to send two players to take part in an open weight class tournament. Most of the players who were sent were big guys, but not necessarily household names. Once at the event, all of the players' expenses were covered and the prize money to be won was higher than the prize money offered in the professional armwrestlers' division. While the inaugural AWI event at the Maxim Hotel did not have national television coverage, this first pro football team tournament was filmed for NBC. Future Pro Football Hall of Famer Fran Tarkenton and pro armwrestler John Woolsey did the colour commentating. Unfortunately, for whatever reason, the show was never aired. The event took place at the Tropicana Hotel in Las Vegas and there was an impressive turnout of NFL football players -- whether to take part in the competition or just to watch. For example, 6’9” Ed Lee “Too Tall” Jones of the Dallas Cowboys, one of the top players of the period, competed in the tournament, while Hall of Famer Jim Brown and future Hall of Famer Walter Payton were there to take in the action. The Oakland Raiders won the Pro Football Team Championship, with 6’9” Charles Philyaw being the top individual competitor. Undeterred by the NBC deal falling through, Tony ran a second Pro Football Team Armwrestling Championship in June 1979. This time the event was staged at Caesars Palace. It was possibly at this event where Mr. Celeste made a small change to who was invited to compete in the Team Championship. While in 1978 teams sent whichever players they wanted, now at least one of the players had to be more recognizable. This typically involved teams sending one lineman and one running back or defensive back. The second Pro Football Team Championship was won by Charles Philyaw and the Oakland Raiders once again, but the event also went off without national television coverage. 1980 was a big year for AWI, because it was this year that the Pro Football Team Championship was finally picked up by a national cable network -- ESPN -- which had only been launched the previous September. The event started being called the "NFL Super Classic". The show split air time among the football and pro armwrestler divisions. By around 1980, the AWI events had adopted an original, though often criticized, bracketing system that Tony developed. It can be described as a two loss round robin (three loss round robin for the pro sport team divisions). The matches were conducted in rounds, in a round robin fashion (with random draws), and competitors would keep advancing until they lost two matches. This would lead to match-ups between undefeated pullers and pullers with one loss as early as the second round. A scenario that was therefore possible was that in a field of 20 competitors, the third best puller could be knocked out of the event after his first two matches if he was unlucky enough to be matched with the top two pullers in rounds 1 and 2. Though many pullers didn't like this format, it was used at all AWI events from that point on. Nevertheless, competitors still attended the events, because of two main factors: big cash prizes, and the chance to be on TV. AWI table top from the early '80s. The table is deeper than most used today, and the back of the elbow cups aren't as close to the back of the table. The pro football division was run slightly differently. In the first round, every player had to pull a match. From round 2 onwards, the team could decide who would pull subsequent matches -- the player who was believed to have the best chance of winning. So even though the tournament was labelled as a "team" championship, a team could win even if one of the two players was the worst puller in the room (as long as the other was the best). Because the pro football division used a three loss format, even if both players lost their first matches, all teams progressed to at least the second round. The early '80s can be considered the heydays of AWI. Most of these years featured four regular events: a pro armwrestling event in January, usually consisting of two weight divisions, the Super Classic in June, the Tournament of Champions in August, and the Holiday Classic in December. The Super Classic featured the NFL team championship, and usually a men's pro light heavyweight division (210 lbs). The Tournament of Champions usually featured a pro lightweight (165 lbs) division and for a few years (circa 1981 to 1983) also had an NHL Pro Hockey Team Championship as well as an NBA Pro Basketball Team Championship. The Holiday Classic typically featured a pro men's heavyweight (211+ lbs) division as well as a MLB Pro Baseball Team Championship. Most events also featured either a pro women's lightweight (145 lbs) or heavyweight (146+ lbs) division. Because the pro sports team championships always coincided with the respective sports' off-season, many sports teams were able to send players. The basketball and hockey team championships were only held two or three times, while the baseball team championship was held half a dozen times and the football team championship was held every year through the '80s and then sporadically during the '90s. In a few of the early years, Virgil Arciero and John Woolsey would occasionally put on armwrestling clinics for the professional athletes a couple of days prior to the event. These sessions mostly focused on teaching proper positioning to avoid possible injury. However, some of the athletes showed a genuine interest in learning technique and asked great questions. In today's world of professional sports, it's difficult to imagine top athletes being allowed by their teams to compete in an armwrestling contest, considering the risk of injury. However, it seems players were allowed to engage in this type of activity back then, which allowed for some very interesting television. The AWI events were known for introducing a controversial rule. Tony didn't like slips and he didn't like using straps. When a slip occurred, the referees would restart the match with competitors starting in a "powerlock". This consisted of pullers gripping up as usual and then the referee would turn the hands into a hook position to start the match. If a competitor then twisted out of the "powerlock" he could be given a foul. 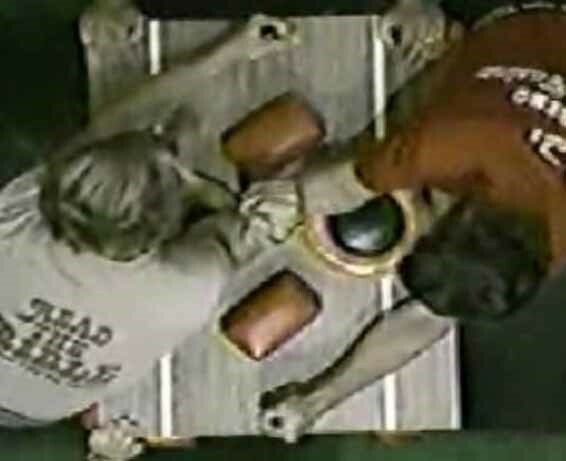 In 1988, the rule was changed so that all matches began in a powerlock. This rule obviously made some pullers unhappy (typically top-roll specialists), but even so Tony kept it. Tony was able to secure the financial help of several different sponsors over the years. AWI's major sponsor in the early '80s was Jeno's, a company that made frozen pizza products. "Jeno's" was featured in many of the event names from the era. In the mid' 80s, Mentos (the brand of mints) was a major sponsor, followed by Makita, a manufacturer power tools, in the later part of the decade. In the late '90s there was even a brand of tobacco-free chewing tobacco, Smokey Mountain Snuff, that was a sponsor. The venues used for the AWI tournaments really set the organization apart from the others. Tony put on events in many of the top hotels and casinos -- primarily in Las Vegas, but also a few in Lake Tahoe and Laughlin. Among others, events were held at the Imperial Palace, the Tropicana, the Riviera, and Caesar's Palace. For a professional sporting event, you can't get a much more prestigious venue than Caesar's Palace. Most, although not all, of the AWI events were broadcast on national television. The majority of the pro sports team championships aired on ESPN, and a few of them aired on the USA network. 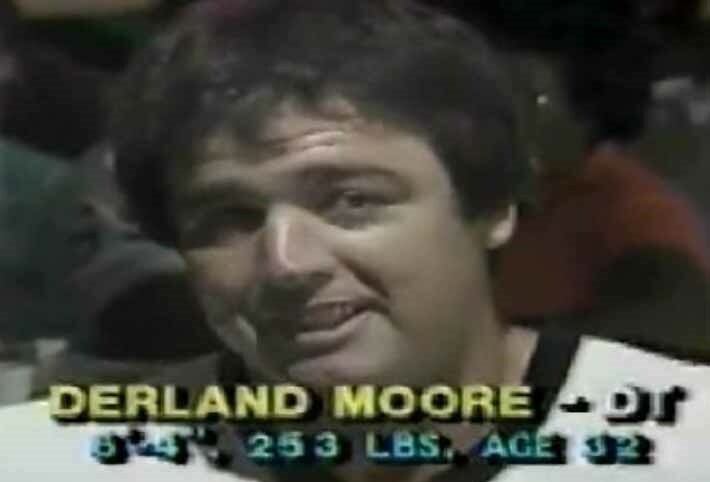 In 1983, NBC's Real People aired a segment centering around the 1983 World Pro Super-Heavyweight Championship, where Cleve Dean demolished the competition. In the segment, it was revealed that the correspondent Byron Allen’s upper arm circumference was the same as Cleve's wrist circumference! The AWI events were officiated by a variety of referees. The inaugural event at the Maxim Hotel was officiated by two of the Jeffrey brothers (Bob and Larry), known for their innovations in armwrestling tables. Many of the early events were officiated by Bob Campregher, and active west coast referee, and Virgil Arciero. Jean Celeste would often act as referee for the women's classes. Even Ed White, an NFL player, helped officiate several events. 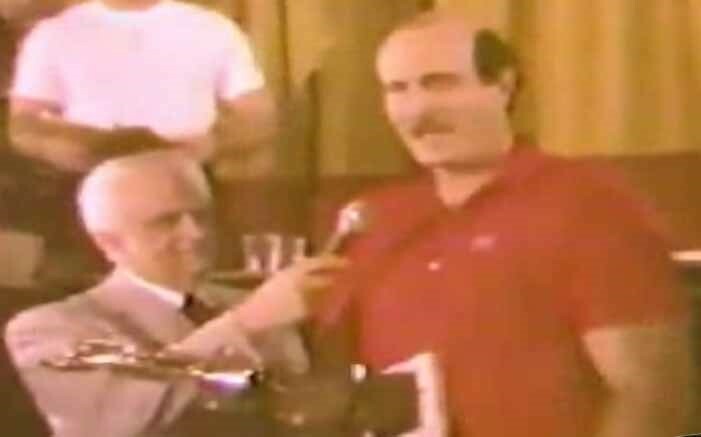 Ed took part in and won the NFL armwrestling title in 1975, by competing in a series of events that Steve Simons ran that year for CBS Sports. Ed genuinely liked the sport of armwrestling and actually put on some events, first in Minnesota when he played for the Vikings and then in the San Diego area when he played for the Chargers. He competed in the 1981 AWI Pro Football team event and made it to the top four, and soon after began officiating events. His inclusion added a bit of star power to the events. By the '90s, fewer AWI events were being held, often due to sponsorship difficulties. The NFL Super Classic continued to be the most regular of the tournaments, but even it wasn't being held every year. The final event was held in 2001, 23 years after the inaugural tournament. The Dallas Cowboys won the team team championship. The early '80s events saw a great rivalry emerge between Johnny Walker and Clay Rosencrans. Between 1980 and 1984, they took the top two spots of the light-heavyweight division at the Super Classic (with Clay winning twice and Johnny winning three times). The Super Heavyweight Championship that was held at Caesars Palace in January 1982 saw Cleve Dean take third place, rather than his usual first. Between 1978 and 1986, Cleve lost to only four different people, and he was beat by two of them that day -- Virgil Arciero and Ed Arnold. However, Cleve came back for revenge at the 1983 event where he easily won. John Brzenk started competing in AWI events in the mid-'80s. In footage from the 1984 Super Classic, his name was listed as "John Bruzek". By the late '80s when he was distancing himself from the rest of the pack, you can be sure his name was spelled correctly. Tony Celeste's AWI events were a great example of what professional armwrestling should aspire to be - full of talent, in great venues, with big prize money, and national television coverage. Though many have attempted, no one has since been able to match the bar that Tony set and maintained for so many years. Arm Wrestling International's spot in armwrestling history will forever be secure. Special thanks go out to John Woolsey, who provided much of the material for this article. His cooperation was invaluable.